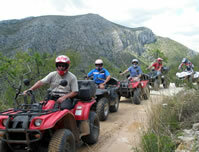 Our guides will take you by Kayak from Les Rotes to the stunning and beautiful protected nature reserve of the Montgo. We combine this activity, kayaking with snorkeling in and around the caves. We have single & double kayaks available. The trip starts off from Denia, directly opposite the beach and close to the port. We take the kayaks and equipment with our trailers to Les Rotes where the fun begins. We then go kayaking along the stunning coastline of the Montgo Nature Reserve to the entrance of the caves, known as La Cova Talla, where we can have refreshments before we go snorkelling in and around the cave areas. All equipment is provided, kayaks, lifejackets, and snorkel gear. The tour lasts approx. 2 hours. To book Kayak & Snorkeling you will need to fill out the booking form below.